Together, we achieved our dream: we collectively acquired the Mothe Chandeniers Castle. Together, we believed we could do something extraordinary to protect and bring our Heritage back to life. Because we dared to dream big. Today, we can dare to dream even bigger: you chose, through your vote last May and by a large majority, to extend our domain and acquire the chapel, the farm building and the park. Should we succeed, we could welcome visitors as early as the end of June 2018. Bringing the Mothe Chandeniers Castle back to life is a very involved project, as one would imagine. Because it was sold in many parts in the 80s and in the 90s, the domain was divided between 5 owners. 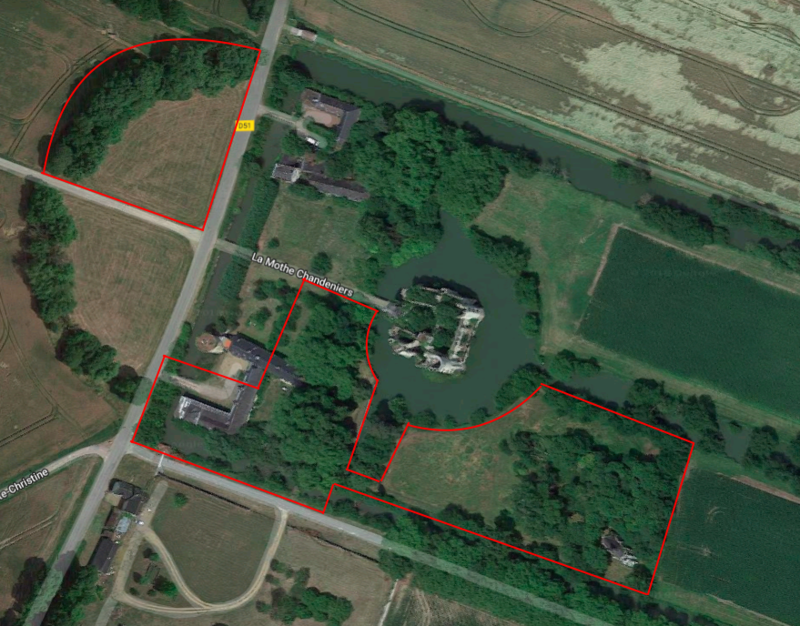 As mentioned in the last campaign, only the red parts indicated in the below photo were included in the selling agreement: one farm building, the path to access the castle and the castle itself. Our wish today is to acquire the new lands that were not part of the initial selling agreement: the chapel, the farm building and the park. The second phase of this project would be to find a solution to reunite the surroundings of the castle under its banner. We have been negotiating for a few weeks now to offer a project which could complete the great adventure we went on last year. We found an agreement with the owner of the South & South-East Park of the domain. Her property includes: a large park, a chapel, a large part of the manager's house, the stables and the castle's garage, as well as a land on the other side of the road. These properties account for 2.1 hectares. In return, the current owner will be allowed to live in her current house for the same duration (5 years), but will let us the full use of the park. Why should we buy now? - The economic development of the Mothe Chandenier Castle has to be at at the heart of our approach to guarantee a long-term saving project of the castle. - The inside of the castle being unusable during the works, the purchase of this domain will allow us to create an economic activity from July 2018. We forecast to welcome 30,000 visitors in 2019 and to open the park for events. - The park, the chapel and the farm buildings are fantastic tools for the future of the castle: events, visits, and eventually with your help: accommodations, reception halls, weddings. - Even though our wish is not to reunite the whole domain of the castle (approx. 2,500 hectares), having the possibility to use all of the lands next to the castle are important to us. - The land includes important Heritage landmarks, among which a splendid chapel. - This purchase can also help us solve the main issue that we will have for the opening to the public: the parking. It could be settled on the land indicated by the red arrow on the image bellow. What works need to be done? From a sanitary point fo view for the buildings, works need to be carried out, which we are starting to budget but there is no emergencies. Most of this work could be done during voluntary works. 1. Securing the chapel to open it to visitors and we will later work on the pinnacles and on the woody small clock tower. 2. Carrying out a clean up, to anticipate the future developments of the project (accommodations, public sanitary facilities): approx. 30,000 €. 3. Consolidation of the "contre-escarpe" walls or at least a shoring of the walls for the moment. A draining of the moats is planned to check the stability of those walls. 4. Strengthening the frameworks and the covering of the stables and the garage and arrangement of the parts, which are in good shape. There will probably be other purchasing phases that will allow the final reunification of the park, the castle and the farm-buildings. How will this operation work? The Mote Chandeniers SAS wished to launch a new crowdfunding campaign in order to raise the necessary funds for this acquisition. This campaign is only opened to co-owners and will allow them to acquire, should they wish to do so, more shares of the SAS. You are, by no means, obliged to participate to this campaign. It is a privilege reserved to co-owners. This campaign has the same format as the one of the acquisition of the castle. - At the end of the campaign, you will be able to assert that right by giving 1€ per share. As soon as the authentic act will have been signed, we will fully own the park and the farm-buildings (Plot number: 60, 61, 153, 145, 144). Only one entity owns the castle and the newly acquired lands: the Château de la Mothe Chandeniers SAS. Should you have participated to the first campaign but not to the second one, this will not change anything regarding your rights or possibilities to access the SAS properties. At the end of this 30-days campaign, all donors of the first and second campaign will be allowed to buy in the capital of the Château de la Mothe Chandeniers SAS by investing 1€ per share. At the end of this campaign, how will the shareholding be composed? Today, there are 35,093 shares distributed among 27,910 co-owners. At the end of this campaign there will be 35,093 shares + the number of new shares bought during the campaign by the co-owners. At the end of this campaign, from which company will I now be a shareholder? You will remain a shareholder of the SAS du Château de la Mothe Chandeniers, which will be the owner of the whole castle, park, chapel and farm-buidlings. 1 share = I donated 50€ to the first campaign and I do not wish to donate to this second campaign. 2 shares = I donated 50€ to the first campaign and I also donated 50€ to this second campaign. Will a lose my share(s) if I do not participate to this campaign? Participating to this campaign is not mandatory. You will remain a shareholder of the Château de la Mothe Chandeniers SAS. Why should we contribute again by donating 50€ even though we still did not give a 1€ per share to become a co-owner? No worries, you will be invited at the end of this campaign to give 1€ per share to buy in the capital of the Mothe Chandeniers SAS. We have chosen to open this second complementary campaign before the capital increase, as it is easier and less costly for the SAS to make all the co-owners buy in the capital at the same time. Besides, we could not postpone this campaign, as the funds are immediately needed in order to secure the purchase of the new parcels and to welcome the public. Any other questions regarding the ongoing processes with the SAS? ... and contact us, if needed, through the contact form. A soon as this campaign is over, you will be invited to give 1€ per share. This deposit will concern both the first crowdfunding campaign for the collective acquisition of the Mother Chandelier Castle AND this new crowdfunding campaign for the park, the chapel and the farm-buildings. Therefore, this SAS capital increase allowing all the shareholders to buy in the capital, will concern both the shares bought during the collective acquisition of the Mothe Chandeniers Castle AND the shares bought during the new crowdfunding campaign for the park, the chapel and the farm-buildings. You will therefore be, at the end of this campaign, shareholders of the Château de la Mothe Chandeniers SAS, that will own 100% of the castle, the farm-buildings, the chapel and the park. This step will confirm your shareholding in the Mothe Chandeniers Castle. Dartagnans and Adopte un château share a common vision: to create the largest community of culture Heritage defenders, a national trust "à la française", as it already exists in England, with their 5 million members and 600 monuments. The collective acquisition of the Mothe Chandeniers Castle represents one of the biggest step in the battle that we have been leading for 2 years. Gathering as many talents, coming from all over the world, from all ages and cultures, in 2 months shows that the vision we are carrying is not as utopian as we first thought. If the Mother Chandeniers castle is currently our action's standard bearer, it will not remain lonely for long. Warning! Just like the first campaign for the collective acquisition of the Mothe Chandeniers Castle, your donation will not be tax-deductible. Thank you all for your great support!